The newest addition to our "mini farm" is chickens! 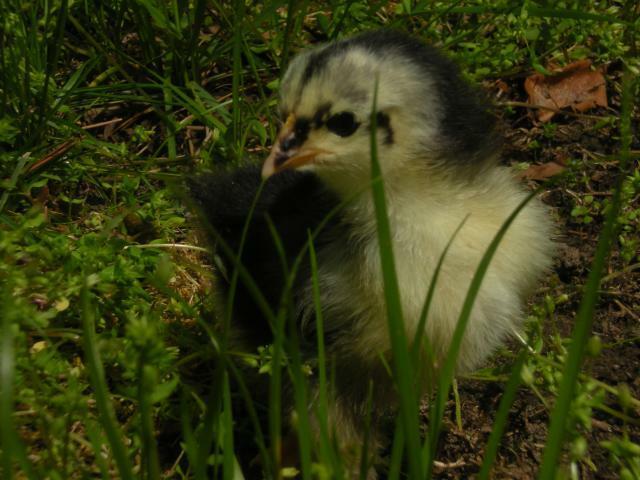 Ordered chicks from hatchery in February with friends. All were vaccinated. 4/14 A total of 36 chicks arrived, 2 DOA. Immediately gave water with Quik-Chik, added Gro-gel to feed, and placed under heat lamp in brooder with wood chips on bottom. 3 chicks lethargic. All beaks were immediately dipped into water so they could find. Tried to hand feed and give water to the 3 that were lethargic to no avail. All three died. Later that day 2 more lethargic and tried to force water and feed to no avail. 2 more died overnight and a 10th in the morning looked lethargic. Gave sugar water and it perked up, could now stand and open eyes and would drink water on her own, but would not eat. With in 3 hours she too died. 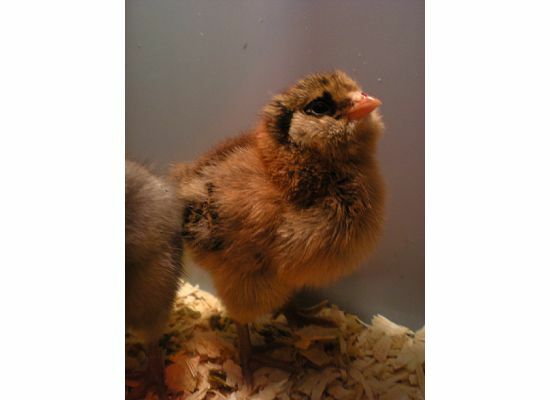 The hatchery is now sending 10 replacement chicks with 15 free red and black star roosters for warmth. The should arrive 4/20 or 4/21. Hopefully, all goes well. The new chicks arrived Sunday 4/19 to main PO. Receive the call that we could drive 36 min to pick them up ourselves or wait until tomorrow when the would be at our local PO. Well of course we picked them up on Sunday! All chicks arrived safely and healthy. MM sent an extra plus 13 red star roos for warmth. We were able to put them in with the 1 weekers and all are doing well. It's amazing to see how much the one weekers have grown! They are getting their tail and back feathers and are trying to fly! 4/22 Added a stick to brooder this morning and all the 1 weekers are eyeing it up. I have seen 1 of the Easter Eggers on it. They want out of the brooder bad! 4/24 I can't believe how much the chicks have grown. Even the babies which are now 1 week today, are starting to get feathers. Now that we know everyone is healthy that hardest thing we've had to deal with is coming up with names! So far we only have 3 of 13 names. Sahara the older BO that made it through the dehydration/stress her "sisters" didn't, General the Red Star roo (after General Tso' chicken), and Pongo the Black Australorp. *sigh* It's so hard to come up with the right names. 4/26 Everyone was outside for the first time today. They didn't know what to do with themselves. It was so funny. 1 more name. The younger buff orp is now known as Buffy. 6/16 Well, it seemed to take forever, but the chickens are finally outside in their coop! The entire family worked (against the weather, family obligations, surgery on DH's shoulder and an accident involving a nailgun and my finger) to get the quickly growing chickens outside and into much roomier quarters. 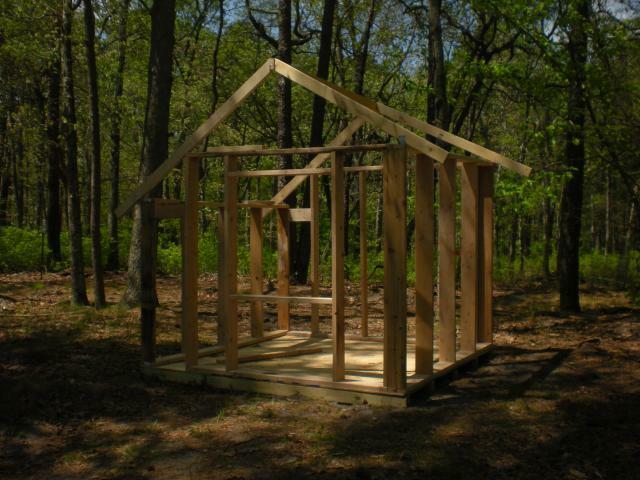 It was hard to get too many pictures as I was busy working on the coop myself. 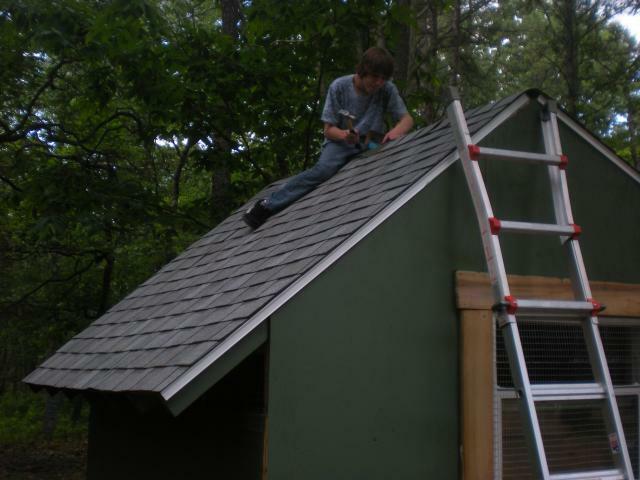 My DS finishing up the roof. There is still a bit of work to do, such as trim, pop door, nesting boxes and run, but we are getting there!